Remember SP1 is a pre-requisite for the December 2012 CUs. Following on from Part 1, this post will look into the SharePoint Task List and Connected SharePoint sites. As mentioned in part 1, I did create a post on this for the Preview release of Project Server 2013. This post will revisit the SharePoint Task List and Connected SharePoint site functionality. Similar but simpler SharePoint Task List functionality does exist in Project Server 2010 with the New > From SharePoint List option in the Project Centre. This functionality has been improved and extended in Project Server 2013. 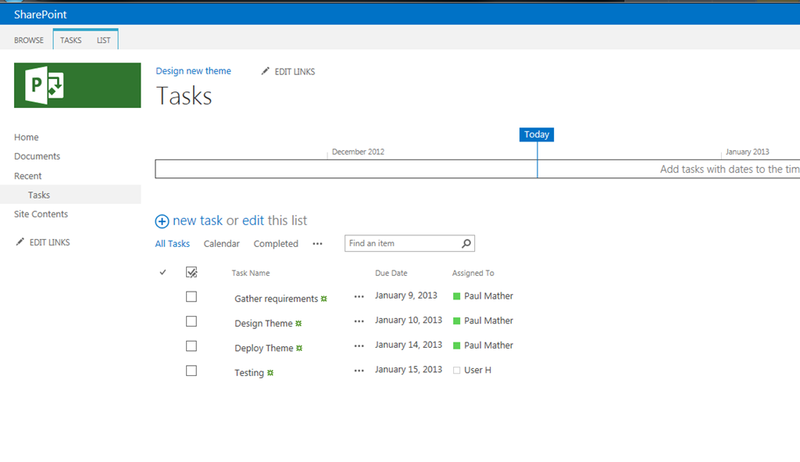 Clicking Create will create the SharePoint site, with a Tasks list and then take you to the newly created tasks list. This is because the Project Web App Connectivity site feature is activated when the site is added to Project Server. 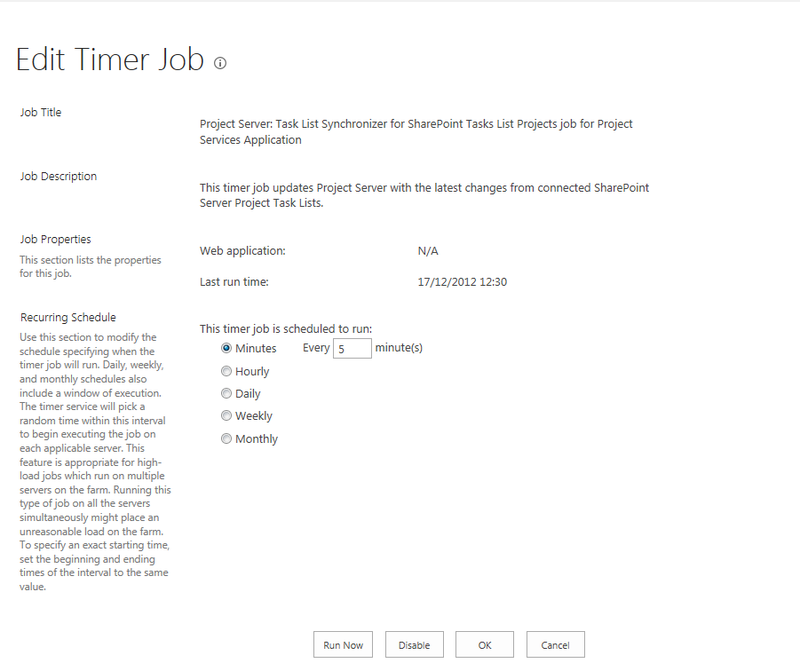 Once changes have been made to the connected SharePoint sites and the timer job has run, all data in Project Server will be correct and in sync with the task list. This includes the resource assignments / availability views, Project Centre Gantt charts and the Reporting tables / views in the Project Server database. 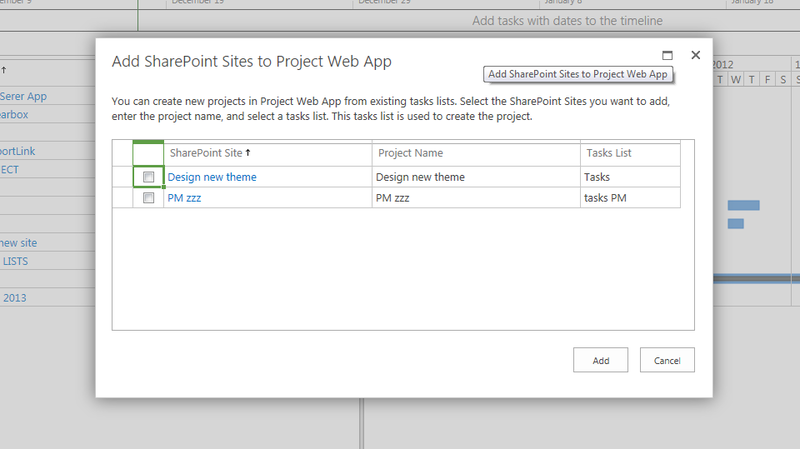 The connected SharePoint site task lists can either be updated from the sites using the web browser or using Project Professional 2013. 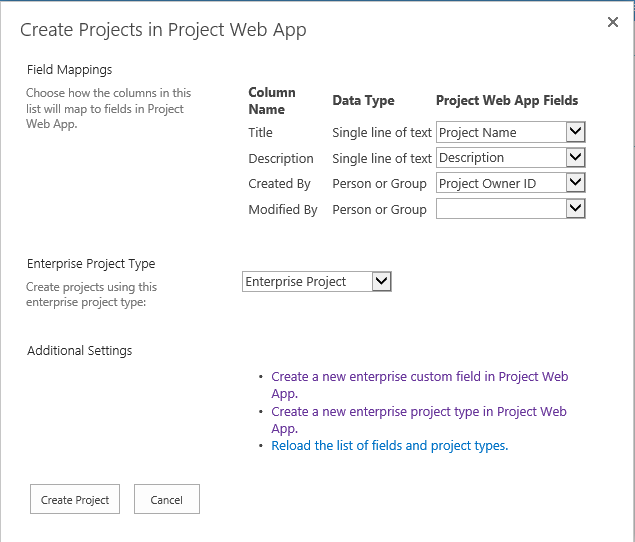 When using Project Professional 2013, connected SharePoint site projects are opened the same way as a full Enterprise Project. When editing a connected SharePoint site in Project Pro you only have the option to save, no publish. Saving this type of project from Project Professional automatically fires off a publish job keeping the data in the system in synch – you don’t have to wait for the Timer Job. 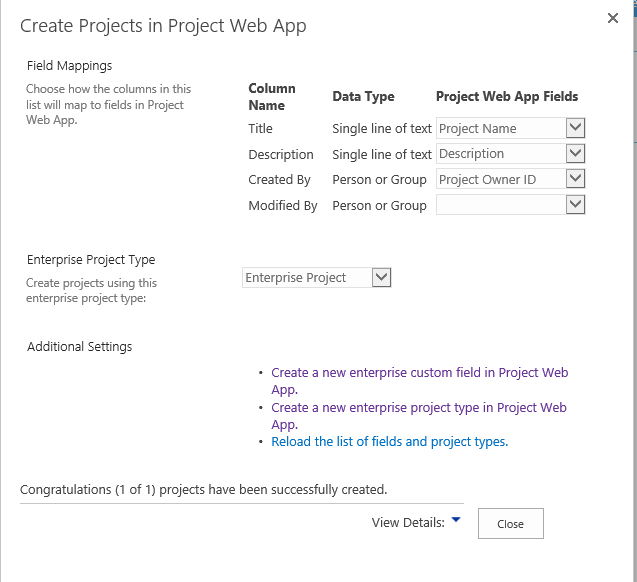 Converting a SharePoint Task list project to an Enterprise Project will disable editing of the tasks list from the SharePoint site, the tasks can only be modified via the Project Web App or Project Professional 2013. 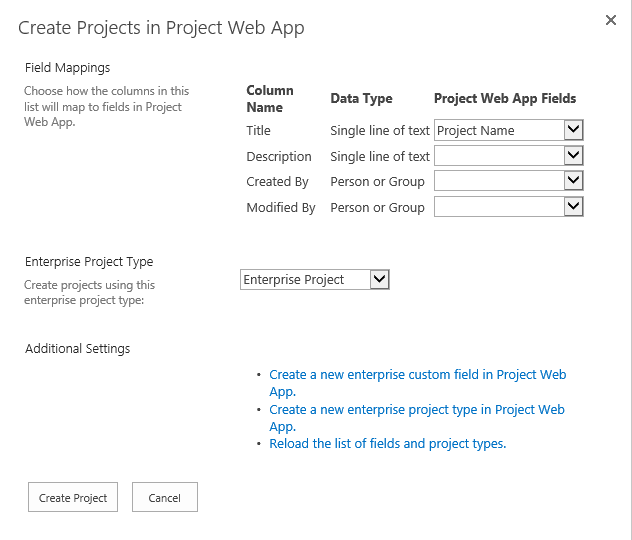 Converting an Enterprise Project to a SharePoint Task list project will disable editing of the schedule in PWA and enable tasks to be edited in a SharePoint task list or Project Professional. Overall a great way to manage simple lightweight projects and gain visibility of these projects in Project Server! As you are all hopefully aware Project Server 2013 is available to Volume Licensing, TechNet and MSDN accounts. No doubt you have seen may posts already about the great new features, some of which I have also previously blogged about. This post will look at the various options you have for creating and adding projects to Project Server 2013. In this series of posts I won’t cover the options of creating projects programmatically or the options that exist in Project Server 2010 already. These posts will look at the new options in Project Server 2013. I will set this project to be an Enterprise Project. A nice and simple approach to transition project ideas to full Enterprise projects. I will now create another Project Idea but this time select SharePoint Task List, see below. The project tasks can be created in the task list, this is then synchronised back to Project Server using the “Project Server: Task List Synchronizer for SharePoint Tasks List Projects job for Project Services Application” Timer job. I will expand on / review this post for the RTM version of Project Server 2013.